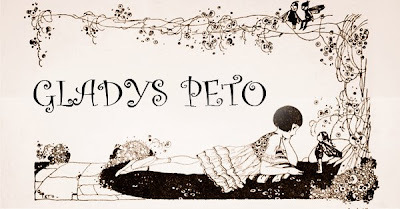 Dear Gladys Peto: I came upon your delightful illustrations in children’s books where every picture changed the way I would look at the Art Deco era of childhood imagery. Each page is a charming adventure with stylized flowers pressing their fanciful image throughout, story after story of adventures of young girls as never portrayed before. Although you were well-known throughout the United Kingdom in the 1920s and 1930s it’s time to introduce you to American audiences for you were one of the greatest artist of your time. So popular were your illustrations during the ‘30s that it was ‘in fashion’ to wear a Peto dress, printed, of course, with your identifiable designs. Your style was in such demand that you often worked as a costume and set designer for the theater and the transition of your designs from storybook to stage put the spotlight on your unique oeuvre. Peto’s work remains appealing today for a whole new generation of admirers. Its unique and inventive Art Deco style, which critics say was ‘clearly influenced by Aubrey Beardsley,’ captures something magical of the world of childhood. As an illustrator of books for children, she is in a class all of her own creative genius and she wrote some of the stories herself introducing a yesteryear of happy romps through childhood. Peto’s images draw the reader to the curious world of sullen young girls with slender limbs, exquisitely dressed as if going to a party, immaculate and poised as if on the brink of some mischief or adventure. Her oeuvre was extensive. In advertising art Peto is best known for illustrations for the infant formula, Ovaltine, as well as a host of other well known products featured in magazines and seen everywhere on posters. Peto’s fame was spreading into other product areas. Her illustrations were proving so popular that in 1929, the pottery company R H & S Plant Ltd., manufacturers of porcelain and china at the Tuscan Works in Longton, England, produced an adorable range of children’s nursery ware decorated with her artwork. Tea sets, mugs, plates and bowls featured her adorable characters imprinted with sayings such as “Dance just as I do, If you can, the Fairy says to Little Anne.” Peto’s reach into the lives of children took further claim with several ‘handkerchief books’ produced to depict her artwork. These charming publications contained six square children’s handkerchiefs made from Irish linen, and covered subjects such as school time, nursery rhymes and Alice in Wonderland. (1890, Maidenhead, Bershire-1977, Northern Ireland.) Peto did not come from a long line of artists, she was the first in her family. After attending Maidenhead High School and art classes in town, she headed off to London to study at the London School of Art. She took up a daring career path and became a successful commercial artist. Her design style and fashionable imagery caught on and the story book artist was born. Later, in the 1920s she married Cuthbert Lindsay Emmerson, of the Royal Army Medical Corps, and traveled with him to Malta, Cyprus and Egypt. Her travels are strongly reflected in drawings, paintings and writings from this period, and in her travel books, such as “The Egypt of the Sojourner,” published by J.M. Dent in London for their Outward Bound Library. 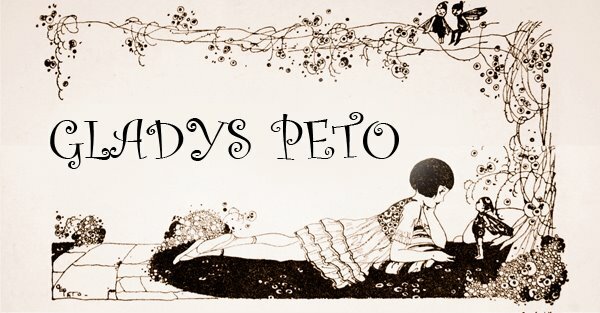 AN ARTIST OF EXTRAORDINARY ORIGINALITY AND TALENT GLADYS EMMA PETO, AN ILLUSTRATOR AND WRITER SO ACCOMPLISHED, DESERVES TO BE RECOGNIZED FOR HER PIONEERING WORK AS AN ILLUSTRATOR AND FOR CREATING THE CURIOUS WORLD OF YESTERYEAR CHILDHOOD. Dear Celia Thaxter: I discovered the incredibly beauty of your poetry inspired by your life on Appledore, one of the Isles of Shoals off the coast of New Hampshire, when I visited so long ago. 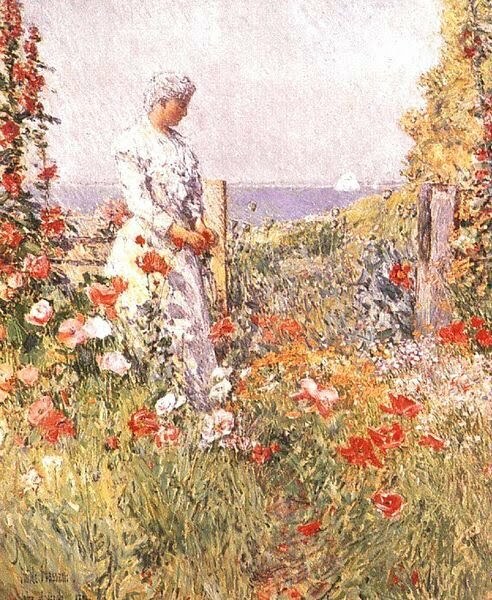 Your island garden so painstakingly maintained by the Portsmouth Horticultural Society brings to mind the patience and endurance of a woman whose love for the minutest detail of nature found its way into your poetry and also your watercolors and ceramics. Every flower, leaf, bug, slug, sandpiper, seabird and the mighty gray rocks were your friends and blossomed into poems of joyful recognition for their amazing contribution to a life well lived by the sound of the sea. At first glance the Isles of Shoals seems very sad, stern and bleak, but to you Appledore, where you lived, it was enchanting. You perhaps ascribe your poignant poetry to the sound of the sea to the fact that people forget the hurry and worry and fret of life after living there awhile, and, to the imaginative mind, all things become a dreamy tableau of never ending beauty. The eternal sound of the sea on every side seemingly wears away the edge of preoccupation with the mainland; sharp images become blurred and softened like a sketch in charcoal and tranquility takes over the senses. By Celia Thaxter: As happy dwellers by the seaside hear In every pause the sea’s mysterious sound, The infinite murmur, solemn and profound, Incessant, filling all the atmosphere, Even so I hear you, for you do surround My newly-waking life, and break for aye About the viewless shores, till they resound With echoes of God’s greatness night and day. Refreshed and glad I feel the full flood-tide Fill every inlet of my waiting soul; Long-striving, eager, hope, beyond control, For help and strength at last is satisfied; And you exalt me, like the sounding sea, With ceaseless whispers of eternity. Life on the Isles of Shoals, in its remote and pristine beauty vividly colored Celia’s poetry and prose. As I witnessed this sea-locked vista I can tell you that the landscape of the Isles of Shoals has changed little since the time when Thaxter lived there. First as daughter of the lighthouse keeper on White Island Lighthouse and then later on Appledore where her family had the finest island hotel which became an intellectual and literary Mecca drawing artists like Willam Morris Hunt and Childe Hassam to the Shoals as well as well known authors. The burden of caring for her brain-damaged child, Karl, and an invalid husband, Levi, must have weighted heavily on her and would surely have been enough to discourage any writer, but Celia was committed to her role as a poet. She wrote with quiet passion of the place and land that she loved most and gave poetry readings daily throughout the summer season at Appledore. That breaks in tender music on the shore.